Water and war « Hercules and the umpire. I spent lots of time representing the Central Platte Natural Resource District when I practiced law. It was fascinating work for a wonderful client. This experience also honed my trial skills, and taught me much about the scientific method. 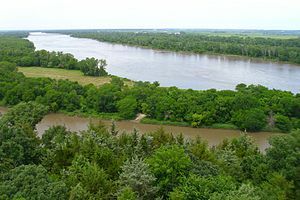 I fought about water in the Platte River primarily for use by farmers. This was in opposition to the eco-nuts. The world-wide scarcity of water will bring especially difficult legal challenges. Consider, for example, the Colorado River and disputes about it between Mexico and the US. The same is and will be true for the US and Canada regarding the Great Lakes. The drought in California pits the world’s most productive farmers against urban dwellers. If you have an established water rights or environmental practice in the US, these problems are liable to make you fat and happy. The rest of us not so much. *Long ago, back when the plains were being settled, a pithy saying developed about H2O: “Whiskey is for drinking, and water is for fighting.” Everything old is new again. Maybe the eco-nuts you fought were not so nutty after all. Possible but not likely. They were all about the Whopping Crane (which I understand is quite tasty when fried). The whooping crane is the canary in the coal mine. The whooping crane is actually one of the early and great success stories of the environmental movement. If I recall correctly, at one point there were only a bit more than two dozen of them. Through protection and care, the numbers increased exponentially so that today, while there are hardly the millions of birds that there once were, they are not on the brink of extinction. A great resource for the effects of natural resource scarcity in general (and water in particular) is the work of Thomas Homer-Dixon – some fascinating (and horrifying) analysis of water access as a weapon/catalyst for conflict in places like Senegal and the Levant. And not to take ribbing too seriously, but many of the concerns that the eco-nuts have dovetail with the long-term concerns that agriculture should have, e.g., that if the effluvia from ag and industrial pipes wrecks fresh water supplies no one eats/drinks in safety. As far as saving endangered species… well, we might be a bit late to the game on that fight. see, e.g., “The End of the Wild” by Stephen Meyer, the many articles of David Jablonski. On the subject of Whopping Cranes, I know a fair amount. I spent around 10 years studying the creature as a part of my legal duties to CPNRD. The Big Bend reach of the Platte River over which my client had jurisdiction was found to be “critical habitat” for those ancient birds by a goofy declaration of the Fish and Wildlife Service. The birds are hardly a success story. We have spent tons of money keeping an ancient species slightly alive only to deprive evolution from taking its natural course. See John F. Kennedy’s inaugural address and whooping cranes, Hercules and the umpire (October 15, 2014). Unlike the Sandhill Cranes that won the evolutionary contest, Whopping Cranes are incapable of surviving without man going to absurd lengths to keep a few of these Edsels of the bird world alive. Welcome to NE Jon, Judge K is one of our progressives. Good thing federal law is supreme then! Please don’t condemn me on a cross of gold. When I refer to “eco-nuts,” I mean those folks who view environmentalism as religious in nature rather than scientific in nature. Aha, well, while the interests may still dovetail, long-term, mutual agreement between the pragmatic and the fervid is unlikely. The conflation of passion with unblinking consistency is another recurring disappointment. Well said. All the best. Although I am pretty much a lifelong New Yorker, many decades ago while in law school in California I took a class called “Water Law.” While much chiding by my fellow law students ensued, I was nonetheless fascinated by the legalities associated with water in the West–where it is relatively scarce–versus the fact that water is plentiful in most of the rest of the country. When you build large cities in deserts (Los Angeles), or have most of the people in your state situated far from where the water is located (northern vs. southern California), there is perhaps no choice but to develop a body of law dealing with this issue. Otherwise, violence becomes the only viable alternative to the absence of water. Water law is fascinating, I agree. The science about surface water and ground water is also fascinating. Lot of math models that confused the hell out of me. The eco-nuts will be replaced by the econauts (Greenland & Antarctica Invade The United States). The scarcity of and plentifulness of water indicates that H20 land is now more and more a very nuanced realm. Whooping Cranes and Blue Crabs got the friends of Whooper’s involved in Texas water laws where they were not welcome. Whooper’s are very bad parents and that is a major contributing factor to their dire straits. Yes, they are bad parents. In addition, some have no sense of direction as witnessed by the fact that it is necessay to fly ultra light airplances to lead some of them south. The internationally recognized biologist we hired years ago described how one began to migrate south, but the silly thing got confused and turned again north and into the death of the coming winter despite all the cues to the contrary. You can’t fix dumb. The harms associated with climate change are serious and well recognized. The Government’s own objective assessment of the relevant science and a strong consensus among qualified experts indicate that global warming threatens, inter alia, a precipitate rise in sea levels, severe and irreversible changes to natural ecosystems, a significant reduction in winter snowpack with direct and important economic consequences, and increases in the spread of disease and the ferocity of weather events. (Global Warming Induced Climate Change Is A Matter of Law). That is water law too.